Even though it may be a bit of a cliche, there is no denying a time of need may provide the foundation for a great story. After all, at the beginning of many stories a character needs to escape from dire circumstances in order to achieve something in the world, to fulfill a dream or to fight odds which have seemed insurmountable at first. Masaharu Take’s “100 Yen Love” does not necessarily tell a success story, but one about fighting, about challenging the most dangerous enemy one can imagine: yourself. For Japanese director Masaharu Take the beginning of the 2010s marked quite a low point in his career, which had already almost two decades by that time. Due to the economic crisis, he tells the South China Morning Post, he found himself without a job like so many of his colleagues in the industry. 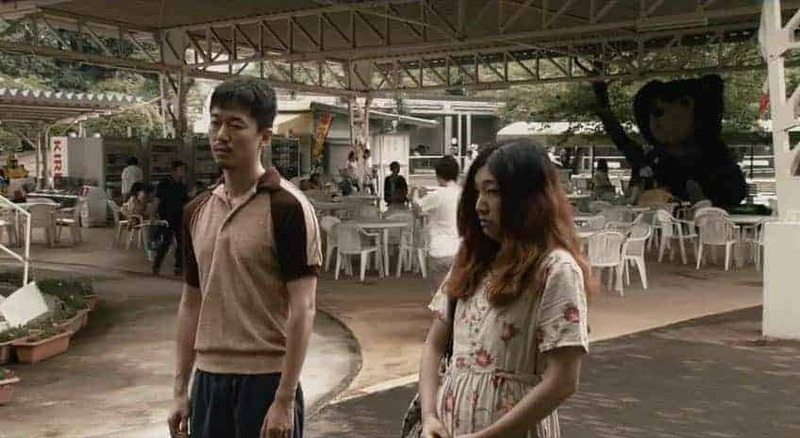 Together with scriptwriter Shin Adachi, who was facing similar circumstances, he finally decided to come up with their own project, a story about a crisis of confidence which would mirror the state of their home country at that time. Even though he admits he had never thought to see the finished film on the big screen, the production and eventual success of “100 Yen Love” marked a decisive point in his career. After she has quit her studies 32-year-old Ichiko (Sakura Ondô) lives at home with her parents. While her sister Fumiko (Saori Koide) helps out her mother (Miyoko Inagawa) in the bento shop, Ichiko spends her days, mostly in bed, in front of the television and eating candy she regularly buys in the 100-yen-store close by. However, after an especially heated argument between her and Fumiko, Ichiko eventually decides to leave home once and for all. She also takes a job at the store as a cashier. On her way to her new home, she regularly passes by a boxing studio. One man, Yuji (Hirofumi Arai) has caught her eye and she becomes fascinated with him as well as boxing as a sport. When she is abused by one of her colleagues and disappointed by Yuji, she wants to take more control over her life. Even though she has been training for some time now, she starts to spend more time in the boxing studio aiming to be a professional boxer and fighting her first match. Considering Take himself has admitted his film was inspired heavily by works like “Raging Bull” and “Rocky”, especially fans of sports movies will come across familiar territory. The story of the underdog or one lacking self-esteem is a story which “100 Yen Love” has in common with these stories, but this does not mean Take’s work lacks originality. In fact, the amount of detail invested, for example, in showing Ichiko’s environment and her motivation to take up boxing is quite extensive, creating an emotional bond between the rather odd, impolite character from the beginning to the committed boxer she becomes. Perhaps the best aspect within the film and ultimately Arai’s script is the idea of the “100 Yen”-mentality Ichiko has applied to her life as she is comfortable with the slacker-mentality she has adopted over time. In the end, as with the Sylvester Stallone iconic character this concept becomes a confirmation of her origins and something she does not want to forget (but also wants to leave behind and never return to). Whereas the plot does not hold any surprises, the central aspect making people invest in the story is the performance by Sakura Ando in the leading role of Ichiko. Besides the remarkable physical transformation the actress had to go through in around three months of shooting, her character’s development from insecure and dressed in baggy clothes into a wiry, ambitious boxer is quite stunning. Leaving the physical aspects aside, Ando does not only play a variation of the “likable loser”-character, but reveals certain emotional layers of her Ichiko which have made her accept losing as the status quo in her life. The equally great Hirofumi Arai as Yuji becomes not only a mere love interest to her, but also a symbol for not giving up, playing fair and fighting against the strongest enemy of them all which is yourself. Unsurprisingly, one of the first images of Ichiko boxing is when she faces her reflection in the mirror practicing her first jabs as well as her defensive position. Finally, “100 Yen Love” is a story about not giving up, about becoming stronger and creating a new perspective on life and about yourself. Even though its story might not be the most original and drags on sometimes, its central performance as well as the understated approach in Hirofumi Arai’s script make “100 Yen Love” a quite touching experience. This is especially true for the magnificently shot and acted finale.